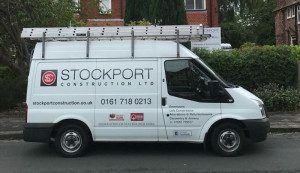 Stockport Construction are experienced construction specialists. We pride ourselves on providing a reliable, professional service and maintaining high standards in all aspects of building work. We only use the very best materials and this teamed with our skilled workmanship means you are guaranteed the very best results! You can also rest assured that in the work place we adhere to the appropriate health and safety legislation to ensure both our own safety and that of our clients. We work in both the commercial and domestic sectors throughout Stockport and Greater Manchester. Whatever your requirements we can oversee the whole project from conception to completion, meaning a stress free experience for our clients. Glyn Johnson is a member of the FMB (Federation of Master Builders), giving you the assurance that all our work will be carried out in a professional manner.